Two-year letterwinner who moved into the starting lineup at shooting guard this year ... Sharp-shooting lefty who can play both guard spots ... CoSIDA Academic All-America candidate. AS A SOPHOMORE IN 2002-03: Played in 24 games as the Wolverines’ third guard ... Played both point guard and shooting guard throughout the season ... Scored in double-figures six times, including career-high 18 points against Penn State Altoona Jan. 20 ... Added 17 points against Bethany Feb. 8 ... Third on team with 22 three-point goals ... Opened season with three straight double-digit scoring performances ... Made a three-pointer in 15 games. AS A FRESHMAN IN 2001-02: Appeared in 14 games, earning first letter ... Playing time increased steadily as season progressed ... Came up with 10 points and three steals in 29 minutes in quadruple-overtime victory against Westminster Jan. 29, 2002 ... Pulled in four rebounds against Washington and Jefferson Feb. 9, 2002. 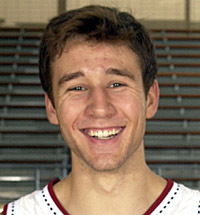 HIGH SCHOOL: Four-year letterman at Anderson High School ... Earned All-District honors. GAME HIGHS: 18 points (vs. Penn State Altoona, Jan. 20, 2003); 5 rebounds (vs. Carnegie Mellon, Nov. 23, 2002); 5 assists (vs. Westminster, Feb. 27, 2003); 30 minutes (vs. Bethany, Feb. 8, 2003). OTHER: Is a Dean’s List student.